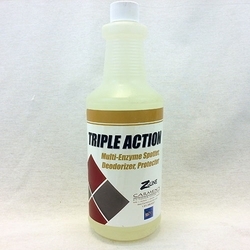 A ready to use multi-enzyme carpet spotter, deodorizer and protected designed to remove stains and odors caused by spills such as urine, vomit, food, feces, pet stains, milk, wine and coffee. Utilizes a broad spectrum odor couteractant that chemically neutralizes the malodor and bacteria stains to eliminate the stains. It is a complete solution for carpet spotting and can be used as a spot remover as well as a pretreat. Contains "Soil Guard 2000" technology from Dupont.